With the extended summer season, a group of friends and I wanted to do another short trip. In the past, we’ve done day rides to different waterfalls in Luzon. The problem though is that aside from the distances and elevation traveled, most of the time, trips would entail hikes limiting our appreciation of these landmarks of nature. 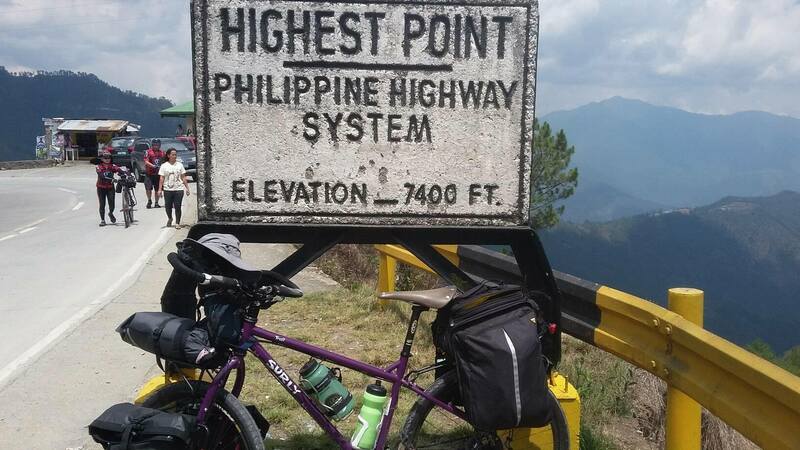 This time, we set an overnight bike trip to Ambon-Ambon falls in Laurel Batangas, which is approximately 70km from Las Pinas (about 85km from Manila). Since one of our friends comes from the area. For the first day, several riders and i met in Molito Alabang to pedal our way to Tagaytay. The fastest route was through Paliparan heading to Silang. Reaching the roundabout of Tagaytay city early afternoon, we went down via the Sampaloc road, an approximately 15km descent to Batangas. Upon reaching Talisay, we pedaled our way to Laurel, Batangas (about 8 km and left our stuff in one of our friend’s house) and proceeded to the falls. riding to the falls is both a rewarding yet physically challenging experience due to the mixed terrain of gravel, rock and mud and several stream crossings. This went about for approximately 2km. Good thing weather was dry and heading to the falls wasn’t much of a problem. To end the first day, we spend the night at our friend, Ferd’s house on top of the mountain. The next day, we got back home by pedaling our way up to Tagaytay via the Sampalo-Talisay Road which is 15km of mostly climbs. The early part of the day was really hot but rain fell early afternoon making the climb more manageable. Heading home was a breeze as we simply backtracked our way. bike hikes can be demanding as you need to dismount constantly on varying terrain. In this case, it was good that we used slippers or sandals during the trek to Ambon-Ambon falls. It is advisable to make the trip 2 months after the rainy season as the falls wasn’t too strong during the summer. In fact, some friends said that the there isnt any water in the falls during the peak season of summer. Bringing a light bike helps when you carry your rig around during the hike. It is advised to set your bike rackless for trips like this. I’d say Ambon-Ambon falls is a good day trip if you’re looking for a good challenging ride with a taste of varied terrain in your adventure. Batangas, which is located south of Luzon, Philippines features one of the best diving spots in the region. Though I have had a couple of day tours and a 2 days bike trip, a couple of friends and I organized a tour on the island of Tingloy in Batangas. I’ve heard of the enticing beach in this place but what intrigued me is the bike route that lies ahead. Given the summer season, this tour was perfect to do cycling and swimming. We were 13 riders in total and met at the Buendia bus station in Pasay and left 2 in the morning to catch the first trip of the day. After 3 hours, we arrived at Batangas Grand Terminal and pedaled roughly 20km on our way towards Anilao port passing by the town of Mabini and others. steel forks on sea water! After going to the market for food and supplies, dealing with our boat captain, loading our bikes on the boat and We got to Tingloy island around 8 in the morning and started our trip towards Masasa beach, the popular public beach in the Island. While the route was quite straightforward and mostly paved, we were amazed with the site of the beach as well as the rock formation around the area. After a long climb back to head to the town proper, we decided to proceed to another beach in the island and explore the backroads after a light snack. The road to the beach was both an exciting yet challenging one as it was a combination of paved, hardpack and singletrack paths. Though it was estimated that the backroad to the other beach was about 7km, the intense heat, varying degrees of elevation of climbs and terrain made the trip an ordeal. We arrived at the beach early afternoon and setup camp. Good thing there was a nice homestay that allowed us to stay for the night. For the second day, some friends went to the beach for another round of swimming while others just relaxed in different areas. After meals, we were picked up by the boat at 2pm and got to Anilao port an hour later. Getting to the terminal early evening, we left for Alabang terminal at 630pm and got back to the city around 9pm. For an island trip that runs around approximately 15km, this has got to be one of the most challenging routes for me due to the heat, climbs and terrain. Aside from steep climbs on paved and trail paths, we had to contend with fist sized rocks throughout the offroad parts (about 40%) and in some of the steep descents. Though CX bikes can manage this, plus/fat bikes are very much capable of handling the terrain in the island. Of course, skills in trail riding helps. The cost of the bus from Buendia to Batangas is 160Php but we were ripped off by the DLTB bus as they charged 200 pesos per bike! Good thing the ALPS bus service going back home didn’t charge any for bike storage. Heading to the Tingloy Island from Anilao port can be tricky as boat trip schedules can be tight . Though you can take the regular trips for as little as 70 Php (which you may arrive late morning in the island as we have seen with other bikers during our trip), it is advised to go with a group and arrange transfers with other boats and negotiate the price. For our trip, we spent 730 per person for roundtrip transfers. Sure it may be pricey, but we chose our own schedules our stuff was secured by the staff throughout the trip as we were the only passengers on the boat. Since bike tours help you manage expectations, it is best that items such as cooksets, canned food and water filters are brought when you do this as stores charge higher for items in the island and there are very few them. Also, the island cuts power at 12 midnight and resumes at 12 noon. This past week, we had a long week vacation due to the ASEAN summit. There were several groups and individuals who had multi-day trips and a couple of friends and i decided to do the Infanta Loop in Quezon province, southeast of Luzon, Philippines. We left the resort at 730 and it was nice 20km stroll to Infanta, Quezon and started our climb back to Manila (via the Marilaque highway). As far as i recall, it was a long stretch of climbs of gradual and some steep sections (around 20km in total at least). As a consolation though, weather was fair (certain parts of the route had a different climate due to the elevation and land mass-that’s why we encountered rain all day) and very few vehicles would pass…the view was stunning as well. Road Construction-what do we get to the other side?! One challenge though is that the bridge connecting Infanta to the next part of the highway heading home was under construction and good thing is, the locals and workers helped us transport our bikes to the other side. The road home was a bit slow and we got home quite late but the trip was well worth it. The Infanta Loop is a nice quick tour if pressed for time and for someone looking for training for longer trips, this one is a worthy challenge. Weather is one issue that needs to be considered as there are areas with a micro-climate. That is, it can be scorching hot in the lowlands and heavy rain when you get up. Since the area is less frequented by vehicles in the evening it is advised that you bring strong lights as there are very few street lamps on the way.